So the new Super Hub has launched, and in the lead up to it we did some work with the press office on all the issues that can cause wireless issues within the home – and when you consider that well over half of all WiFi problems we get are environmental as a result of interference or the signal being absorbed anything we can do to get the message out in the public domain can only help. 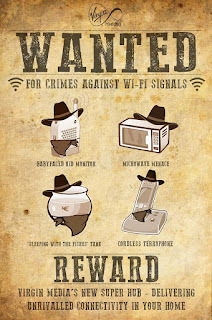 Now, while it was nice of the press office to refer to me as a “top broadband sheriff” (!) in a fun release, it does emphasise a really important point about the root cause of most wireless issues that customers do experience – which is why we developed Discover Broadband to share the hints and tips a customer can follow to get the most out of their broadband. The biggest "crime against wi-fi signals" in my experience is the default configuration of Super Hubs: they use a double-width channel for 802.11n, which overlaps with at least two-thirds of 2.4GHz channels. With most of my neighbours on Virgin Media, this means a lot of interference. It's great that the new Super Hub will move some of this interference out of the 2.4GHz band to 5GHz (where there's more space and less chance of interfering with your neighbours), but I expect it's still using wide channel in 2.4GHz as well for devices which can't use 5GHz. Access to the new hub should not be denied to 20Mb customers as some of us have devices in both 2.6Ghz and 5GHz bands and would benefit from concurrent access. That is not a function of line speed. But if Virgin Media do not wish to supply new hubs to 20Mb customers for purely financial reasons, then if the original hub is capable of supporting dual band in hardware, there needs to be a software update to enable it. "This hasn't been the case for some time. The original default was HT40 (300Mbps), which he refers to as the double channel width. We changed every Super Hub on the network to HT20 (144Mbps) early in 2012 and the default has been HT20 since R36 rolled out mid 2012." Andy - have passed your feedback on. The original superhub is not capable of simultaneous 2.4 and 5 GHz broadcast. This is a hardware limitation. All VM customers are able to get a "new superhub", but it is chargable on lower tariffs - at a price which is much lower than any similar router at retail price. Premium radio controlled models use digital radio control systems in the 2.4GHz band. As they are designed to control model cars and aircraft, they have a considerable range and therefore power. There are two basic types and both use spread-spectrum techniques (as indeed does WiFi, but the modulation scheme is different). One type uses Frequency Hopping Spread Spectrum (FHSS) and this operates at a single frequency, but that frequency varies rapidly (a technique known as frequency hopping and similar to Bluetooth). This type will produce random corruption of the WiFi signal and may slow down the communication speed. The second type is called Direct Sequencing Spread Spectrum (DSSS). One of the popular makes that uses this system is Spektrum. This type uses a single frequency but with a very high bandwidth and appears as high power pseudo-random noise. This is much harder to combat as the WiFi signal is designed to be resistant to narrow band interference, but not wide-band, which is what DSSS is. The best advice here is that WiFi and DSSS RC model controllers do not mix and should be kept apart! A nearby digital DSSS RC transmitter will quite probably bring your WiFi network to its knees and it will become very slow or cease to operate at all. How do I know this? Because I was a victim and had to work it out the hard way!